As every serious Serge Lutens fan knows, every year, one fragrance from the "exclusive" collection (i.e., those that aren't exported to the US) is selected as a limited edition addition to the "export" collection (i.e., those that are). These fragrances get packaged in the regular export bottle (i.e., the tall rectangle) instead of the bell jar you get in Paris, and they hang around until they sell out. Last year's pick was Fumerie Turque; this year, we're getting Chêne. I don't know why it is never Iris Silver Mist or Tubéreuse Criminelle, but I keep waiting and hoping. Chêne was launched in 2004, and described as "the comfort and magnitude of oak" (chêne is the French word for oak). It was developed by perfumer Christopher Sheldrake, and the notes include cedar crystals, wood sap, black thyme, immortelle, beeswax, silver birch, rum absolute and tonka bean. Chêne opens on the rum absolute and sweet green wood sap, lightly honeyed, and for a brief time, smells like something I might very much like to drink on a cold winter night. The rum mostly fades as the woods and spices heat up, and Chêne turns dry and earthy-mossy. There is just the tiniest hint of honey and vanilla to sweeten the woods, which smell like freshly cut wood chips mingling with the scent of long-empty wooden spice boxes from another century. Several commentators have detected a pinch of cumin, and there is, for a brief time, a light undertone of something sweaty. Of all of the fragrances in the Serge Lutens Les Eaux Boisées collection, Chêne has the sparest, most unadorned character; the woods are the point here, and while it is beautifully done, it perhaps lacks the big "wow" factor of some of the others in the line. I would call it a sleeper scent — the sort of thing you might dismiss on the first or second try, only to become hopelessly smitten on the third. Anyone could wear Chêne, but as unisex fragrances go, it perhaps tips the scales towards the masculine side. It layers beautifully with Serge Lutens Fleurs de Citronnier, and undoubtedly has possibilities with other florals as well. The lasting power is excellent. Serge Lutens Chêne is $130 for 50 ml Eau de Parfum. In the US, it has so far appeared only at Barneys (I think? ), but it will be at other Serge Lutens retailers eventually. For buying information, see the listing for Serge Lutens under Perfume Houses. 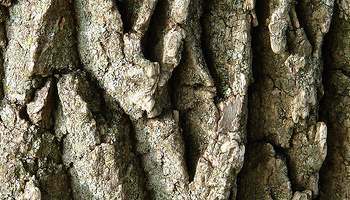 Note: top image is Field907 017 Tree Bark Macro [cropped] by Fractal Artist at flickr; some rights reserved. I only smelled Chêne in the flesh, as it were, about two weeks ago. Until then I'd only smelled the wax sample. I found the juice very pleasant, a bit too masculine for me, but the drydown was absolutely wonderful. I have a 'mouillette' on my desk and I sniff it from time to time. It's really lovely. I'm still puzzled by the fact that I wear a floral scent when I love woody ones so much. LOL! Wonderful review! I like Chene very much, though I don't know that I'm “hopelessly smitten” yet. Still, sometimes, it is just the thing–spare and comforting at the same time! E, I like it much better this time around, and just as well I waited until it was in the export line, right? Good luck with the movers — hope it all goes very smoothly!!!! J, I am betting it would layer beautifully w/ FdO too! J, it really is a comforting scent — interesting that SL described it that way, since it is rare that I find their descriptions helpful. Now I want to try Chene. If Iris Silver Mist ever hits the export line, I'll be forced to purchase. The other SL scents haven't tempted me beyond a decant. Well, then you probably need just a decant of Chene. But seriously, not even Tubereuse Criminelle? Lovely and spot-on review of a great perfume! Thanks to the super-lovely generous Erin, who's written a great review herself, Chene has become one of my favorite SLs. It's strange how the initial 'wetness' (I want to drink the rum too) of the bark and twigs warms and dries to an incredibly 'solid' yet soft scent of what I see in my mind as a looming tree trunk. Agree w/ spare and comforting and will add glorious. Bitter-sweet like sacher tort. Chene is my favorite SL. I love how warm and golden it is for a wood scent. Chene + Black Cashmere sounds intriguing, will have to try that! But no on the Magnetism, I'm behind as always!!! Promise will get to it soon. love chene layered with douce amere or un bois vanille. In fact, of two of those three are great together, especially douce amere and un bois vanille. I don't usually layer but after reading somewhere that the Lutens people encourage it, I have been playing around in the line. I'm beyond smitten, from the first try. Bought my bell jar within minutes which was a first. It's the deep boozy dryness which gets me every time. Really — I would have thought DA in particular would drown the Chene right out! Going to have to try it, thanks. It is lovely, and you're so lucky to have the bell jar! Someone sitting in front of the fire place in a log cabin somewhere in the middle of the woods in winter. The person sitting in front of the fire is in an oversize ivory sweater, enjoying his/her down time with a Jack and Coke and enjoying the down time during a blizzard. I don't know that anybody but Barneys has it yet, but good luck! Wearing Magnetism today, finally, and it's nice! Have not tried the women's Magnetism, but it has a bit of a vanilla Coke vibe that reminds me a bit of Escada Collection — unfortunately don't have any on hand to compare, but I'm sure Collection is much sweeter. I tested this for the first time a couple of weeks ago, and after a short walk went straight back to buy it. It is almost intoxicating, albeit a bit linear. It's also different from anything else on my shelf. It also lasts and lasts and lasts – over 12 hours for me! The best part of all is that the Chene was half price, so I bought the only two bottles they had. For some reason, a couple of Lutens were on sale, so I also got the only bottle of Rousse for half price (which I probably wouldn't have paid full price for), although I left the bottles of Arabie behind. Not a bad deal, was it? Have to say I love Chene, and it has terrific staying power. Where did you find Serge Lutens for half price?!? Inquiring minds want to know! In case the actual purchaser doesn't come back to answer you, I can add that all I know is that it was in London, and only know that because another reader picked up bottles of Chene + Rousse for me while they were still on sale. But don't know which store! Half-price SLs in London?! Where? The only place where I've ever seen discounted SLs (not by very much) was Harrods. But that was, like, five years ago. J, sorry, I've no idea, I didn't even ask. The luck of the Irish again. LOL!